Apron-Front Sink. It’s the perfect sink to withstand heavy use and a large number of dishes. It’s very functional and let’s not forget how great they look. It’s a great addition to any farmhouse kitchen. Wood Flooring. Adding a rich, dark hardwood is a great way to add warmth to the kitchen. Farmhouse kitchens are famous for utilizing wood throughout, so what better way than to start with the flooring? Check out some of our popular hardwood options. Warm Tones. Speaking of adding warmth, you’ll want to add warm tones throughout the entire kitchen. A great way to do this is to add some beautiful flowers on the table or bring in some red hand towels. Keep with browns, reds, yellows, and oranges to help keep it warm, but it can still be beautiful to have accents with cooler colors. Light Cabinets. 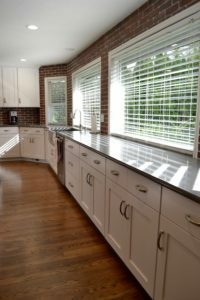 It isn’t a necessity to have white cabinets (nor are any of these suggestions), but it is a staple for most farmhouse kitchens. It helps keep the room open and light. If you’d like to go with dark cabinets then try to pick woods with warm hues. Another option could be mixing dark bottom cabinets with white uppers. A Big Kitchen Table! I’ve never seen a farmhouse kitchen that was complete without a huge table for the family to sit around. I’ve recently seen a transition to a large kitchen island with seating as well. Either way, make sure you have plenty of room for friends, family, and neighbors. If you love the farmhouse feel, but aren’t in love with all the details then go ahead and mix-and-match. Many homes can create a farmhouse feel and still keep modern touches. Switch it up with quartz counters and stainless steel hardware on the cabinets. It’s important no matter what trend you’d like to replicate that it still feels like home to you! PreviousPrevious post:5 Tactics to Turn Your Bedroom Into a SanctuaryNextNext post:Does the Carpet Cushion Matter?